For many people getting rid of an unwanted or dead tree is the easy part, it’s the leftover stump that causes the problems. I’m sure you’ve seen videos of people trying to pull a tree stump out of the ground with a truck, only to have the truck destroyed and the stump untouched. So let’s look at the problem of tree stumps and how best to remove them. Why get rid of a stump? Trees can be felled for a number of reasons such as it is diseased, or has grown too tall and is blocking a view or light getting into a property. Invariably, once a tree is cut down the stump, and the root system remains in the ground. A bare tree stump can be an eyesore in a garden and spoil the vista. Some gardeners think they look worse than weeds, especially over time when other plants such as moss and lichen start growing on and in them. A tree stump can also take up space and be an obstacle in the garden. Depending on how low the tree has been cut, and if there is long grass around them can become a tripping hazard, or cause problems when mowing. If its a matter of one or two tree stumps, then it can be an easy DIY job if approached correctly. If there are more than a handful of tree stumps to get rid of, it might be cheaper in the long run to have a professional tree surgeon deal with them using specialized tools. Other things that need to be considered are the size of the tree stump, and type of tree, and its age. These will all have a bearing on the recommended method to remove the stump. Evergreen trees such as pines have a wide and shallow root system, where deciduous trees have roots that go deep and are long. The age and size of the tree have a great bearing on the ease of removal. Generally the older the stump, the easier it will be to remove, and smaller stumps will be easier to get out of the ground than larger ones. Removing any tree stump is hard work, and getting it out of the ground by hand can be the hardest work anyone of us will do in a long time. Before contemplating removing a tree stump by hand make sure you have the right tools available and know how to use them. Generally a DIY enthusiast will need a chainsaw or a limbing saw, a shovel and digging bar, an ax, pick, power washer, and for best results a four-wheel-drive truck and stout chain. This method works best on trees that have shallow root systems such as pines and conifers. Make sure there is enough tree stump left that it can be levered from the ground. Without the leverage, the task of removing the stump will be much harder. Use the digging tools you have to remove the dirt around the base of the tree and reveal the roots. Once the large roots are exposed the dirt can be rinsed away using a power washer, and reveal more of the root system at the same time. It’s now time to get out the ax and start cutting away at the roots. As the roots get cut through the stump’s hold on the earth should lessen. Give the stump a push to see if you have freed it from enough roots that it is no longer stable. Go around the tree cutting all the major roots with the ax, and pushing the stump back and forward. Levering the stump should entirely uproot the tree. However, if all that pushing and shoving is not enough to get the stump uprooted completely, tie a heavy chain around the stump and fasten it to the tow hook of a four-wheel drive truck. Slowly tighten the chain, and with a steady pull try to loosen the stump from the ground by rocking it back and forth. With a little bit of perseverance, the stump should become uprooted. Once the stump is successfully removed, pull up as much of the root system as possible, and dispose of on the compost heap. The tree stump along with what is left of the roots can be cut up for firewood, as root wood tends to burn slowly and gives off plenty of heat. The appliance of science, in this case, a chemical stump killer is for those who aren’t interested in the manual labor, or have the patience to allow the substance to do its job. The object of this method is to accelerate the natural decomposition process. To chemically remove a stump you’ll need a chainsaw, a drill, an ax, and potassium nitrate. Remove as much of the stump you can above ground using the chainsaw. With a a 1-inch bit, drill holes around the edge of the stump. Move inward a few inches and drill more holes in a circular pattern. The ideal is to have these holes at least 8 inches (20cm) deep. Additional holes need to be drilled into the sides of the stump, so they join those already drilled vertically from the top of the stump at a 45-degree angle. This means you have some V-shaped holes cut into the perimeter of the stump. Liberal amounts of potassium nitrate should be poured into the holes, and then fill them with water. In about four to six weeks the wood of the stump will have become spongy, and it can be easily broken up with an ax. Most garden centers sell specially formulated chemicals designed for getting rid of tree stumps. Even so, there is nothing speedy about this type of removal, and if the stump is large, it may take a number of applications until it is completely rotten so it can be removed. As the chemical method takes time, and removal by hand takes brute strength; if you’re in a hurry, then the burn option may be the best. ✓ As with the chemical option you need to drill a series of holes about 8-10 inches (20-25cm) deep in the center of the stump. ✓ Once drilled clean out the debris, so the holes are clear of any wood chips or swarf. 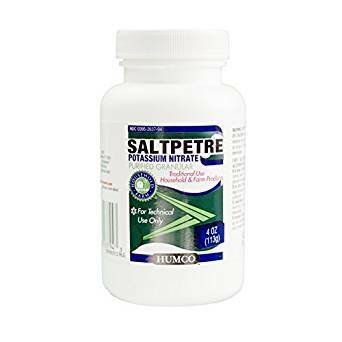 ✓ Pour potassium nitrate into the holes, and fill with hot water. ✓ Keep pouring in hot water until all the potassium nitrate is dissolved. ✓ Cover the holes on the top of the stump with a piece of scrap wood. ✓ Set a match to the scrap wood, so it begins to burn, and wait for the whole stump to ignite. ✓ Once the stump has been incinerated use a shovel to break up any roots or pieces of stump left over. ✓ Back fill the hole where the stump used to be with soil. ✓ If you decide on this option, contact your local authorities first to find out about any restrictions on the time of year you are allowed to burn in the open. If you have a lot of tree stumps to get rid of, then it may be worthwhile calling in the professionals who will probably use a heavy-duty stump grinder to do the job. 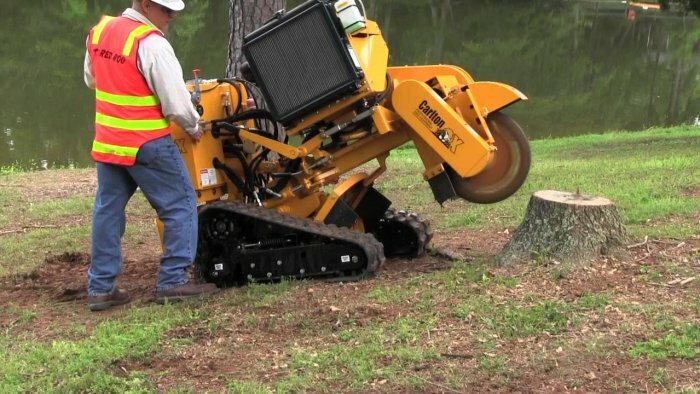 If you have a few stumps, and don’t want the hazard of setting fire to them or have the time for the stumps to decompose, or the brute strength to remove them manually, then you could consider hiring one of these machines. They make quick work of getting rid of a tree stump. These heavy-duty machines can weigh half a ton and can cost up to $200 a day to rent. To make it financially worthwhile, you will probably have a number of large and difficult to remove stumps to deal with. A stump grinder is basically a large carbide toothed grinding wheel that can swing in a wide arc, mounted onto a powered chassis. ✓ Before using the stump grinder clear away any rocks away from the base of the stump. ✓ With a chainsaw cut away as much of the stump as possible, as close to the ground as you can reach. ✓ Using the hydraulic mechanism on the grinder, get the blade spinning a few inches from the stump and then begin moving it side to side as the cutting blade slices through the tough wood. ✓ After grinding away about 4 inches of the stump, move it forward and repeat the process, taking away an arc of wood with each pass. ✓ Keep doing this until all the stump has been pulverized into wood chips. 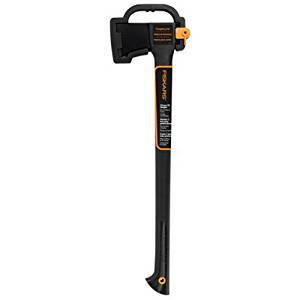 ✓ This is a dangerous piece of equipment, and every safety precaution should be taken when working with it. Operators should at least wear protective eyewear and steel capped boots. Once you have removed the tree stump what do do with it? Well, disposing of it with the refuse seems a waste. Some refusal disposal sites will take old tree stumps if you have no other use for them. If you have an open fire in the winter, then it would be a good idea to use the chainsaw and cut it up into usable logs. The wood can always be chipped into wood that can be used to fire a barbecue in the summer. Having removed the tree stump, you will probably have to backfill the hole where it once stood. If the tree has been cut down in a lawn area, then an application of topsoil and well-watered grass seed, should have everything covered over in a few weeks.